Directions: The following question pertain to the graphing of quadratic relations which are circles. Choose the best answer. x2 + y2 = 144? Center is at the origin. (x - 1)2 + (y + 2)2 = 5? 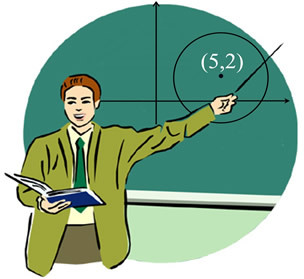 What choice could be the equation of the circle shown below? Which of the following statements is NOT true for the circle seen in the graph? The center is at the origin. The equation is x2 + y2 = 3. The point is on the circle. Write the equation of a circle with a center at (0,0) and a radius of 9. Write the equation of a circle with center at (5,2) and a radius of 7.